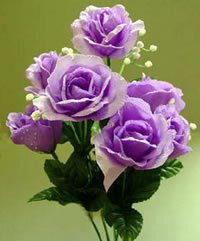 Of all the bouquets of roses that you can choose from these days, few are as rare or as stunning as the lavender roses. Not only are they eye-catching and elegant, but they carry with them a rich history of symbolism and deeper meaning. Many people purchase or grow lavender roses because it is as close as you can get to the unattainable blue rose that so many desire. Everyone knows and appreciates the meaning behind a bouquet of red roses, however if you really want to inspire and amaze your partner, give her a bouquet of lavender roses and watch her eyes pop! There are a number of roses that you could choose to use for your lavender rose bouquets ranging from the older garden varieties to miniature versions and yes, even climbing roses come in lavender. One of the most gorgeous lavender climbing you will ever see will be the Blue Moon climbing rose. Truly a stunner if there ever was one. When you purchase a bouquet of lavender roses, typically you are going to receive the long stem variety which is the most commonly grown and cultivated for arrangements. 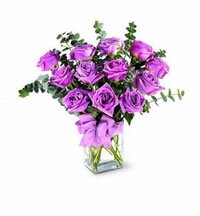 Lavender roses are rich with symbolism which makes them ideal gifts, provided you have the right situation that warrants them. The meaning behind these flowers has certainly evolved over the years. Traditionally, bouquets of lavender roses would often signify royalty and were commonly used to create a sense of majestic royalty. 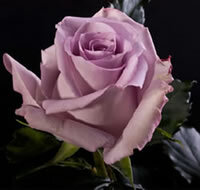 In more modern times however, lavender rose bouquets can be given to a special person to symbolize love at first sight, or to show that person how enchanted you really are with them. Whether or not that recipient truly understands the meaning however is often another matter. Show them this article and just maybe they'll get the hint you are trying to convey! While true blue roses are that of legends and fairy tales, lavender roses are the real deal and they share many of the same connotations with their elusive counterparts. 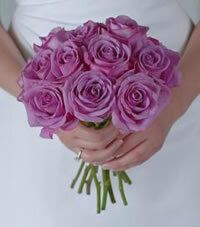 Growers the world over have been inspired by these lavender roses to keep trying to find that truly blue rose. While there are a number of varieties that come close, blue roses unfortunately do not occur naturally so the search goes on. If your interest in lavender rose bouquets runs so deep that you would like to grow these gorgeous flowers in your own garden to have them readily available, then you need not look any further. We can not only help you find varieties that you are sure to fall in love with again and again, but we will even run through how to grow and care for them as well. 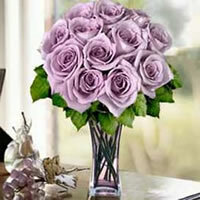 You have several options when it comes to lavender colored roses. Among them are the Columbian Ecuadoran Flower, Ocean Song, Maritim, Cool Water, Purple Haze, Blue Bird, Blue Curiosa, and Blue Moon, just to name a few. The first, and one of the most important, decisions that you are ever going to make for your roses, other than the variety, is where you ultimately plant them. The whole point of growing roses is to cultivate a plant that will produce abundant blooms over and over again. In order to do this all roses need a lot of sunlight. The general rule of thumb is a minimum of 6 to 8 hours each day of direct sunlight, but if you can give them more than all the better! Assuming that you have already chosen the perfect spot to start your lavender roses, you now have to get them into the ground. You would have either gotten your roses as a bareroot plant, or in a container. if you don't already have some on hand, I highly suggest you pick up a bag of organic mulch in advance of planting as well. This will be mixed with the soil you dig up at a ratio of 2 parts soil to 1 part organic mulch. This will give your new roses a great head start on their new live in your garden. For container plants, I like to dig my holes roughly twice the size of the container it's in. This gives it a nice cushion all around for the roots to grow into the soil mix. Make sure the top of the container ball is level with the top of your hole, so the rose maintains its current depth. If you are planting a bareroot plant, then you will need to dig your hole wide enough so that the roots can lay out in all directions naturally, and deep enough so that the bud union is about an inch or two below the surface of the soil. The growing instructions for whichever lavender roses you selected are all roughly the same, however it wouldn't hurt to research your particular variety quickly just to make sure. Chances are we already have an article within this site to help you out. Roses need a lot of water to do well, but the soil also needs to be well drained which some new gardeners often think is contradictory. A good way to tell if your soil is staying too damp is to pay close attention to it after a heavy rainstorm or watering. If the water just lays on top in puddles, then chances are your soil is heavy in clay and can't absorb or drain it away well enough. This is where the organic mulch helps tremendously. Not only will it thin out soils that are heavy in clays (as well as thicken up soils that are too sandy), but it also is great at retaining just the right amount of moisture for when your roses are able to absorb it. It is a simple step that will go a long way towards giving you lavender rose bouquets straight from your garden all season long.